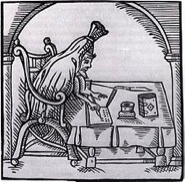 Records of the 16th century writer Robert Greene are, understandably, sometimes sketchy and occasionally contradictory, but it seems that he was a popular and often witty composer of poems, plays and pamphlets. The best known piece of work that was attributed to him posthumously is Greene’s, Groats-worth of Witte, bought with a million of Repentance. Curiously this pamphlet appeared to contain clear and unequivocal attacks on the great William Shakespeare so, presumably, Greene was no friend of his. Other pieces of work, said to be semi-autobiographical, describe a controversial rake who goes about town relieving vulnerable and unsuspecting people of their money and other similar misdemeanours. If he was, indeed, talking about aspects of his own life then that would cast an unsavoury shadow on his character. It is generally believed that he was born sometime during the summer of 1558, in the East Anglian city of Norwich. He was possibly the son of an inn keeper and his baptism is dated the 11th July. His upbringing must have been comfortable as he was able to attend Norwich Grammar School and then go on to Corpus Christi college at Cambridge where he, as a sizar student, achieved a Bachelors’ degree in 1580, following that up with a Masters’ three years later. He was writing and publishing by then and he decided to move to London where he could follow this profession more easily. There is a suggestion in his Repentance piece that he was married to the daughter of a “gentleman” but then abandoned both her and their child to go off to London. In contrast his Greene’s, Groats-worth of Witte, bought with a million of Repentance contained cautionary tales from a supposedly repentant rascal about “coney catching”. This is a term of Elizabethan slang referring to thieves and tricksters who prowl the streets of London tricking and thieving wherever they went. Greene liked to give an impression that he was a knowing, authoritative kind of figure who might be warning readers of the dangers. Some critics though have suggested that some of the characters that he described were based on Greene’s own antics to some degree. Greene was certainly a prolific writer and many plays have been attributed to him although none were published during his lifetime. Titles such as Orlando Furioso and The Scottish History of James IV were almost certainly his whereas others, such as Shakespeare’s Titus and Andronicus, may have been penned by Greene.